I do not think I could ever dislike a Balenciaga collection. Season after season, Nicolas Ghesquière always pulls it off. I think it is the show I look most forward to seeing. This season he mixed it up and threw it all together, and, of course, the outcome looked great. It wasn't a signature Ghesquière collection as I was not able to trace many Balenciaga trademarks, rather it was a whole new vision, a whole new look and it worked. 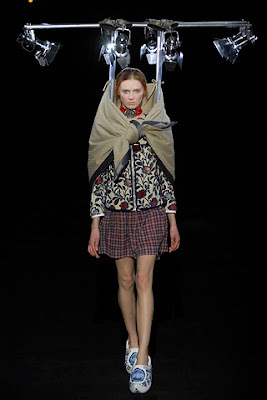 I loved the scarves haphazardly thrown about, they added that finishing touch. 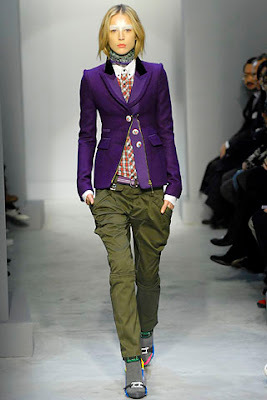 The mixture of colors, purple with olive and royal blue with khaki was upbeat and fun. 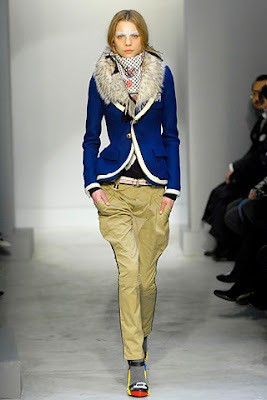 The feeling was preppy meets boho meets street with spats of ethnic flavoring thrown in to rev it up. And if I keep going over the line, I find a masculine touch blending classy and sporty . I guess Mr. Ghesquière put it best, "It’s a big mix—a street mix, with symbols and colors that are very multicultural.” I loved it. Controversial? Yes. Daring? Yes. Correct? Indeterminable. Safe? Indeterminable. 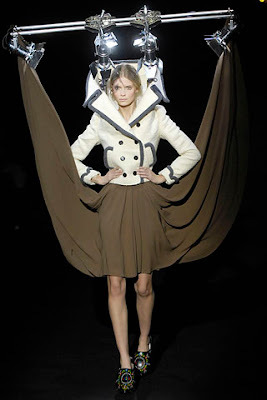 The fall 2007 Viktor & Rolf show took creativity to a whole new level. They sent their models down the runway with, according to style.com, "...heavy steel rigs, further weighed down with tungsten lights and speakers, some of them built up high above their heads," and went on to say, "Then, unable to bend or use their arms to balance, they were asked to walk the runway wearing giant, clunky high-heeled Dutch wooden clogs." Are we talking about a fashion show here? It is hard to really see the full effect from just the images but the audience was, apparently, completely shaken up for they feared tumbling bodies and broken bones. Will V&R be the talk of the week? Of course they will but it seems no one is really talking about the clothes. I guess any chatter is good chatter but I would like to take a moment to chat about the clothes. The clothes apart from the apparatuses were phenomenal in a true V&R way. Tailored, fitted, conservative and edgy. 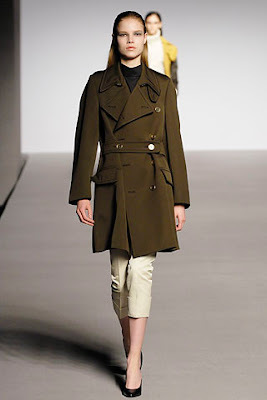 I love the belted trench. They always do great trenches (should have snapped up that H&M one while I had the chance). It was a very serious collection full of mix-and-match patterns, cropped pants, skirts and dresses. The Dutch folk influence definitely was apparent. I wonder if this show is going to stir any new policies and procedures in terms of models and their limitations. I am assuming the focus of the fashion councils will not be so much about their weight but instead their safety on the job. Trends, at this year's Academy Awards, were non-existent. Sure their may have been some similarities if you really dug - strapless, mint green, straight silhouette - but none were strong enough or repetitive enough to be considered a true trend. I feel like this year the girls chose their dresses based purely on their individuality and personality rather than any trend or style. The dresses were all very individual, and I found that most of them really suited the personalities that carried them so gracefully down that infamous red carpet. Nicole Kidman - the statue herself. Jennifer Hudson - the show stopper& scene stealer. Cate Blanchett - cold, yet glamorous with an untouchable air. Cameron Diaz - complex, unforgettable, pure and simple. Jennifer Lopez - secretly still love my bling. Penelope Cruz - glam for the graceful Spanish swan. Jada Pinkett Smith - smart and sassy. Kristin Dunst - soft, sweet innocent. Kate Winslet - comfortable and put together. The end of the fashion week circus is upon us with only Paris left to go. I didn't get a chance to see much of or cover the Milan shows (Note to Self: check style.com to review all shows ASAP) but I sure plan on doing a better job with Paris. Read the full report on fashionweekdaily.com. Robertson Boulevard was, surprisingly, not so chaotic for a Saturday afternoon but even though it wasn't teaming with frantic fashionistas there was still some style watching potential. 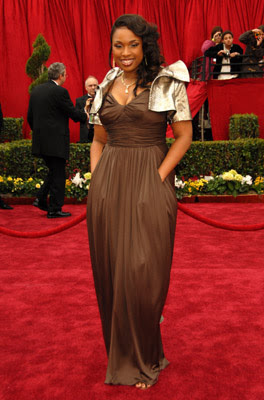 Yet, all this style may have been overshadowed by the red carpet laid out in front of the Kitson boutique. No celebrities seemed to be trapped inside, yet there was a paparazzi worthy line outside the women's shop. Unfortunately, due to the line and my impatient shopping partner I was unable to make my way inside. 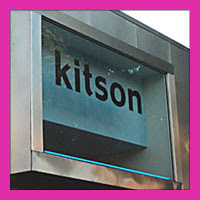 The reason for all this madness outside the Kitson boutique I do not know but my guess - a publicity stunt to generate some chatter (and if so, it worked). I did not get a chance to hunt down the Proenza Lippie but instead bought my first pair of Tory Burch flats. Ok, I know they are starting to cloak everyone's feet but I think they are so stylish and versatile, not to mention so comfortable for everyday wear. I forwent the solid colors for a black and white speckled pair. I can't wait to start incorporating them into my outfits. I'm off to LA for the weekend, I will try to post but if not I will be back in two days with some interesting tidbits from the West Coast. I am not really going on a shopping trip but my only semi-mission is to find the Proenza Pink lipstick that just launched by Lancome (I know I could keep dreaming, right?). 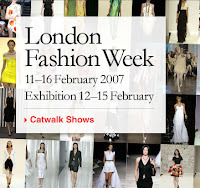 A peak at what is happening at London Fashion Week. Biba - black, black and more black. 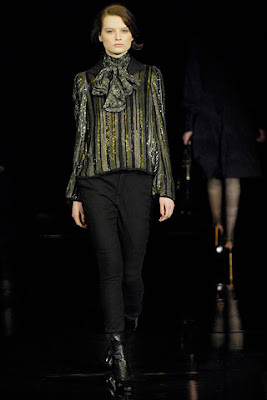 Biba was all about darkness for fall 2007. Even with all the drab there were still some key pieces. 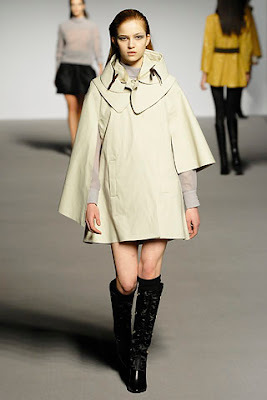 Preen- I loved this collection. A total contrast to Biba, this show was bright, energetic and right on. I sensed a little Balenciaga and Versace, but regardless it was a sharply edited collection. I loved the body-hugging silhouettes - it's sexiness without being to in your face. 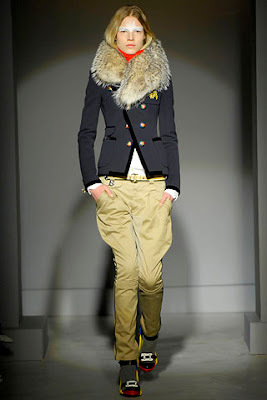 Aquascutum - There were tons of wearable great pieces in this show. I feel like putting my order in now. The look is classy yet there is an edge to it that keeps it chic and definitely a must have item. I wish the American magazines would make mention of this label more often. 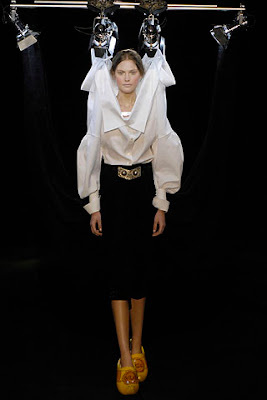 Marios Schwab - Yup, there is definitely a Balenciaga thing going on, yet I still think the collection is sharp and right on. Well, it's not Vogue but it is America's most attention seizing magazine, Beyoncé is Sports Illustrated’s March cover girl. Their annual swimsuit issue always boasts such bootylicious beauties and this month they are no farther than the exact definition of bootylicious than with Beyoncé. I think the photos of her are fantastic. She looks amazing. Her body is certainly shapely (and beautiful) and is on display for all the world to see. That's right world, it’s out with the skinnies, and in with the curvaceous queens. Firstly, I think that more women can relate to a body type like Beyoncé’s, and secondly, I think that it looks more aesthetically pleasing to the eye to see a “healthy” girl smiling bountifully into the camera in her skivvies, than some boney anorexic looking individual. Ok, that may not have sounded right and I will probably be dammed that I have just said that, but this is how I truly feel about the whole thing. Sure there once was a time when I wanted to be boney skinny and for years I was so, so unhappy with my body, always wanting to loose 5 or 10 pounds but now, and for the past couple of years my perceptions about my body have changed. I guess perhaps it has something to do with age, as you get older you accept more things but I also think it has something to do with society’s embrace of girls like Beyoncé, Jennifer Lopez, Tyra, Salma Hayek, and the like (o gosh I am missing a ton). I think these women better represent real women than any runway model and these women should be on that runway (but that’s another issue altogether). To be honest living in 2007 and fully aware of all the different sorts of health issues out there, I don’t get the whole Nicole Richie factor. I don’t understand why Ms. Richie and her Hollywood get-along gang are so skinny. I just don’t get it. It’s really time they, as well as the rest of the world, just get over it. Side Note: I know that there are naturally skinny and slim girls who can not help their physique no matter what they do, so please I do not mean to offend you in any way. I am speaking about this in general terms, thus not specific to anyone or any case. 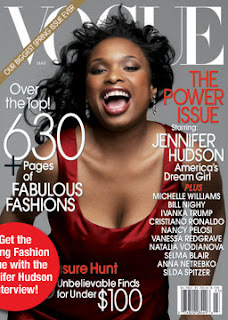 I cannot believe it - Jennifer Hudson has landed the cover of March Vogue. This is an incredible feat; I am still in a sort of shock. We all know that Vogue does not allow, how shall I say, "small timers" on their cover. Not that I think Ms. Hudson will stay a “ small timer” for long, heck she is already a legend. Yet, I am still surprised. Nobody makes the cover. I cannot believe that Jennifer Hudson is on the cover, and not just any cover but the March issue - the most important (besides September) issue of the year. I don't even think Beyoncé has made the cover. Has she? It took Jennifer Lopez, two years to make the cover. I think we all remember that story. Ok, one last time, I can't believe JH is on the cover of Vogue. Well, all I could say is congrats Jen, you so deserve it. You were a great American Idol, you were a fantastic Dreamgirl, both as a songstress and actress, and you looked divine accepting your first Golden Globe (not to mention totally composed and so well spoken in your acceptance speech). You are well beyond on your way. You are so very talented and it’s great to see good talent get recognized. It is actually inspiration for all of us who dream big. I believe that all us dreamgirls can become anything we want to become. Thanks JH for showing us there is hope and that if you have something good to offer it will be received. I think this Vogue cover is an accurate indicator of how big a legend Ms. Hudson is in the making. ALT compared her to Barbra Streisand's debut in the 1969 movie Funny Girl. Yes, we must keep our eyes wide open as we are literally watching this rising star make history and develop into a true icon. London Fashion Week has officially begun and there are some great designers on the schedule that I am anxious to see (or rather view). 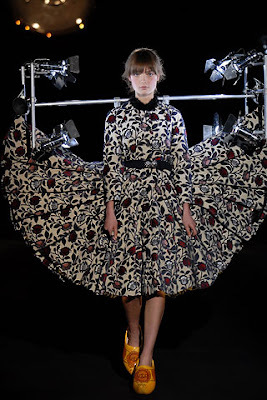 Even though London does not receive the press coverage it so rightfully deserves I think so much happens on these runways, in terms of creativity (of course) but trend direction in general that it would be nonsensical to not respect it in the same vein as we do NY, Milan and Paris. Yet, for some reason we (and I mean the fashion industry) somehow decide to take a rest during this week. Why is it that Anna Wintour has only made, what, one appearance at LFW? 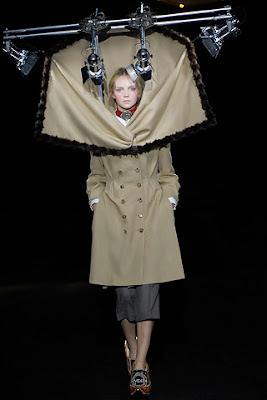 I think that more of London fashion needs to cross over to this side of the pond and fill the pages of Vogue. View the London Fashion Week schedule. There was a lot of leg seen on the red carpet at this year's Grammy Awards . Short dresses appeared to be the hem length of choice for Hollywood's most famous starlets. Short as they may have been, none were, in my opinion, that red carpet worthy. Actually, I don't quite know what went wrong this year but by the way these songstresses were dressed it seemed that no one really put in that extra effort we have all come to expect. And it showed. Yet, of course like always, I had my favorites. Well actually I really had only one favorite. It was Hilary Duff's sequined lingerie-inspired Dolce & Gabbana number. I absolutely adored this dress. I think it was very unique. As my designer friend noted, it was very interesting, the way the lace and sequins were layered; it gave it that extra textural element that completely made the dress. Next runner up was Petra, and then followed by Fergie. I think though, after seeing all those sequins on the fall 2007 runway I have grown a sincere liking to decked-out-in-sequins garb.